In numerology, the number 10 represents completion, endings and new beginnings. Ten e of swords are part of the Suite of Swords whose element is air. Air represents thoughts and intellect in the tarot. Some key words for the ten of swords are rock bottom, back stabbed, betrayal, ruin and loss. When the ten of swords appears in a reading, it can indicate that an individual feels as if they have hit rock bottom and as a result feel ruined. Any plans or goals that the individual has set for themselves will not turn out well when the ten of swords appears. In addition the ten of swords might appear when a person has been back stabbed or betrayed which leaves them feeling deeply hurt. 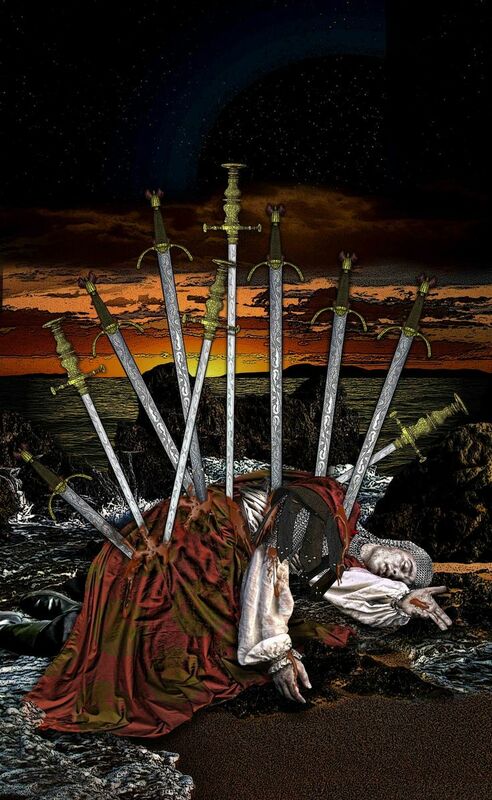 However the rising sunset pictured in the ten of swords tarot cards indicates that things are not as bad as they seem. The individual will be able to pick themselves up, dust themselves off and start anew. When the ten of swords appears reversed in a reading in can indicate a scenario in a person’s life that did not end well. As a result the individual has buried the pain of the event very deeply. In order to heal they will need to revisit the pain and confront it so they can begin to heal. The ten of sword reversed forces an individual to review their thought processes and beliefs so that they can transform for the better and open the door to new opportunities. Want a more comprehensive interpretation of the 78 tarot cards which includes the ten of swords. I highly recommend “The Ultimate Guide to Tarot Card Meanings”, by Brigit Esselmont. This entry was posted in Suit of Swords and tagged The Ten of Swords. Bookmark the permalink. Hi Linda. Thank you so much! I used the Illuminati Tarot deck. Beautiful picures!